This series has been taking a dive into the five phases of sustainable business described in the Hagen-Wilhelm change matrix published in Making Sustainability Stick. We want to offer a roadmap for those working to change business from inside large organizations. By capturing and sharing over a decade of experience implementing these ideas, hopefully we can help accelerate success. 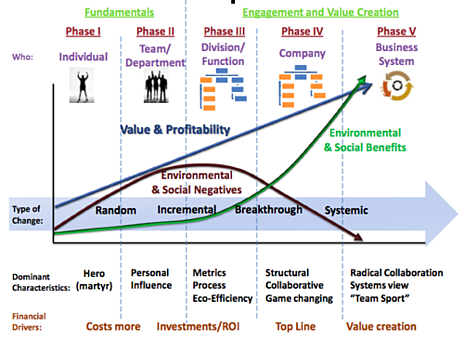 Earlier posts introduce the matrix and go deeper on Phase I, Phase II and Phase III. Phase IV is getting to some rarified space. While there are groups or divisions within companies who are demonstrating phase IV behavior and results, there are few complete companies at this level. To get a sense of how many, I turned to CSRHub. This powerful on-line resource distills some 291 sources of data into a 100-point scoring system. Using CSRHub score as an indicator of where a company is on the change matrix can give an idea of the distribution of companies on the journey. Out of hundreds of thousands of companies worldwide, about 8,500 have been identified and analyzed for their sustainable business efforts. Fewer than 2000 score above a 56 and no company scores above an 80. That suggests that less than 1% of companies are possibly operating at stage IV. With so little real world experience it becomes clearer why there is little understanding of this definition of “sustainability”. It also says that companies just getting started are not too late. An objective score is helpful, but it’s very difficult to use a single snapshot to understand where a company really is. Remember, companies are just collections of people, each one has to make their own shift to sustainable business thinking. So what are other indicators of Stage IV? One is when sustainable business skills, competencies and education are required to be successful at “ordinary” roles. At REI it was pretty much required to understand sustainable forestry and the FSC system in order to be a paper buyer. USGBC LEED accreditation was becoming a necessary credential to work in store development and real estate. Competency with the Sustainable Apparel Coalition’s HiGG Index and other Life Cycle Assessment tools was becoming required to be a Product Designer. And an understanding of social tools like those from the Fair Factories Clearinghouse is needed to be in sourcing. Another indicator is to look at how “sustainability” projects are being managed. Is there a special project office running unique efforts, or are sustainable business criteria helping to drive priority and resources to projects across the organization. How about collaboration? Do good ideas have to climb a whole chain of command and then back down the other side in order to get permission to proceed, or are people at all hierarchy levels empowered to reach across silos to get things done? More clues come from looking at business results. In stage IV negative environmental and social impacts (the brown line) are understood, measured and being aggressively addressed holistically. In fact, through game-changing innovations, negative impacts have been disconnected from company growth and are being reduced in absolute terms without unintended consequences. In other words, the brown line is going down while the business prospers. Beyond success at “doing less bad”, the company has started to identify ways in which it can use the power of enterprise to create value and measurably make things better. The Green Line is on the rise. A good example happened at Gildan, a multibillion-dollar textile company based in Montreal, Canada. At first they successfully improved energy efficiency in their mills in Central America (less fuel, less pollution, less cost = less bad). Not satisfied, they radically redesigned the steam plant that runs their factory, switching from barges of imported bunker fuel oil to biofuels provided by local agricultural waste and secondary crops. They not only eliminated carbon emissions and eliminated a potential spill hazard; they broke their financial dependence on external fossil fuel and replaced it with a stable local energy supply that also provides an economic engine for their community. They used their business to create environment and social benefits while driving down operating costs and insulating themselves from risks. That’s an example of the green line rising – Stage IV results. In previous articles I offered ways to anticipate what's coming and set the stage for successful next steps. The problem this time: No one has reached Stage V, so we're not sure what the keys to the game are. But I can offer an educated guess. Radical Collaboration: As I talked about in an earlier article; Sustainability is a description of a system, not an individual entity or business. Without a forest eco-system not even a tree is sustainable. So in order for business to achieve sustainability we’ll have to do it together. The capabilities for business people to engage with organizations outside their four walls will be critical. While we’re used to working with customers and suppliers, the idea of radical collaboration is effective engagement with organizations in a more complex web - beyond buy/sell relationships. A great example is the Sustainable Apparel Coalition. This is a group of well over 100 Brands, factories, NGOs, academics and others working to make the textile industry more transparent, accountable and profitable by tackling social and environmental challenges. Learning the skills needed to be successful in these kinds of collaborations will certainly be a key in Phase V.
In the final post in the series, we’ll dive deeper into the illusive Phase V.
See Kevin's post introducing The Roadmap Series. 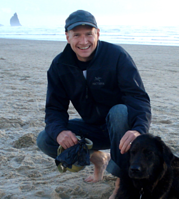 Kevin Hagen is a sustainable business advocate. For over a decade he has helped business be more successful by making the shift to more sustainable thinking. As a leader inside medium to large companies or as an external advisor Kevin helped design and implement successful sustainability strategies and programs. Most recently, Kevin lead Corporate Social Responsibility (CSR) strategy and implementation at REI, a leading outdoor retailer and the U.S.'s largest consumer co-op. Kevin's team delivered great results, received a lot of recognition and showed that a mission based company with nearly $2B in sales can reduce it's environmental footprint while growing profitably. See Kevin's blog where he shares ideas, news and offer resources and organizations that he thinks can help companies make progress toward sustainability while delivering bottom line benefits at the same time. Almost every company I have known to start down a formal path of sustainable business strategy has had the benefit of a passionate advocate for change. Sometime it’s a visionary CEO like Ray Anderson at Interface other times it’s been charismatic internal leaders like Betsy Blaisdell at Timberland or Auden Schendler at Aspen Skiing Company (to name two of many, many friends and colleagues in this category). In fact, there are so many examples that it’s common to associate “green” companies with this style of leadership. Although the charismatic phase is responsible for a lot of progress, in order to move up the matrix and deliver far bigger benefits, sooner or later the personality driven approach has to give way to a process driven program. That shift identifies stage III. A quick recap of the Change matrix for context; Phase I is conventional thinking, it’s where we all start and where the majority of companies still are. Sustainability is confused with “green stuff” or even philanthropy by the organization and sometimes by the heartfelt folks who are acting as heroes (or martyrs) for change. Phase II is marked by that pivotal first step. The company goes from “random acts of greenness” to adopting a strategy or agenda for taking more responsibility for environmental and social impacts. If they are doing it right, they start to see opportunities and begin to enjoy the benefits such as reducing costs and risks. Stage III marks the next big transition. Why move from personality to process? The personality phase is great; lot’s of love, lot’s of attention and lot’s of personal fulfillment for making change. The company is proud of progress and is reaping business rewards. But to make progress you have to change. Why? Quite simply to get more done. No matter how much charisma one has, you can’t be everywhere, it’s not enough and it has a shelf life. All three of the leaders I mention in the opening made this shift and that’s one of the reasons they’re stars. They modeled the transition to organizational process for bigger gains, both inside and outside of their companies. They saw that sooner or later the charm offensive runs out of steam. In addition to leaving your program high and dry, you will leave people inside and outside of the company with the idea that it was just a fad – the bubble bursts. Reinforcing that view makes it really difficult for everyone to make progress. To avoid cratering, it’s really important to be driving the shift toward Phase III well before the infatuation runs out. A critical factor in the shift was one of the “Keys to the Game” in Phase II – rigorous metrics. With a track record of success and measured financial impact you can show the correlation between success and the new metrics. Then pivot from correlation to causation – your metrics are not a happy coincidence, they are the key indicator (even cause) of success. Thus leaders can have confidence that pushing for the next level of sustainability goals will result in more business success. 1. Telling the internal story really well – credit where credit is due: By this time, folks are not surprised by success. In fact, they are taking pride in the fact that the company is more environmentally and socially responsible and they are thrilled that it’s delivering financial returns too. At this point it’s really important to do effective “after action reports” with leaders and influencers. Retell the story in terms of the process so that they understand that success wasn’t luck, it wasn’t one person’s passion and it wasn’t an isolated instance. Success came from following a process of change that can be taught to everyone, repeated often around the company and is worthy of further investment. Make sure that in public, the people involved get full credit and praise, while in private with company leaders the process is the hero. 2. Involve more stakeholders: At this stage you can get a lot done within the scope of authority of mid level managers within the organization, but don’t stop there. Make a point on some projects to cast a larger net for collaboration, more divisions, outside organizations like vendors and service providers and even NGOs if possible. For example if you’re working on energy efficiency, don’t stop with the facilities team. Involve divisions that might be able to make for a bigger win – like the office workers in the space where lights or HVAC is being changed. You can also involve the utility company, perhaps get them to contribute incentive dollars. And you could involve a non-profit such as Environmental Defense Fund’s Climate Corp fellows who can add a lot of horsepower to your efforts. All these stakeholders can make the project more successful, but the real up-side is that you’ll be developing organizational skills for collaborating – a critical skill required in Phase IV. And that’s the hook for coming back for the next article in the Roadmap series – Phase IV – taking it to scale. It’s been 26 years since the Brundtland Report, 25 years since Karl-Henrik Robèrt launched The Natural Step and it was 16 years ago that John Elkington coined the term “triple bottom line”. These landmark works and many that followed have helped build a deep body of literature and casework that we can draw from as we try to implement sustainable business strategy today. The change matrix published in Kevin Wilhelm’s book, Making Sustainability Stick is one attempt to condense much of that thought into a roadmap. It’s based on the experience of folks who have done this work inside medium to large organizations for over a decade and is backed by a large body of academic work, case studies and peer-to-peer networking. Aside from providing a map for the journey, the matrix offers a common picture that can cut through the sustain-a-babble. In earlier posts I described Stage I as “conventional thinking”. While conventional business can arguably be blamed for contributing to some of our biggest problems, Stage II marks the turning point when a company begins to be part of the solution. And ultimately, isn’t that what business is all about? Getting paid to identifying customer problems and deliver innovative solutions. Taking the first step is the key to unlocking exceptional organizational results, unleashing the creativity of your people and tapping a wave of innovation. According to this Harvard research paper, companies that take this step will outperform their peers. Change happens in an organization one person at a time. As a result the people in your company will be spread all over the change chart. Usually it’s hard to identifying exactly where the company is; however, occasionally there are strong markers of exactly where you are. Stage II is marked by the shift from “random acts” to a declared program or strategy. The company takes the first step by starting to take responsibility for the environmental and social impacts of the business and the associated risks and rewards. This shift might start as a defensive reaction resulting from some outside pressure – for example campaigners protesting, some pending regulation or even consumer pressure. Other companies get started by looking for the upside. They see potential in reducing costs or improving employee retention and recruitment. Perhaps they see the potential for increasing sales, but they quickly learn that they need a credible “walk the talk” program in order to earn the trust a “green” customers. Whatever the trigger or motivation the most significant step on the whole change chart is the first one. Stage II is almost always personality driven. Every company I’ve known has a story of who made the shift happen. Sometimes it’s the CEO, and sometimes it’s a passionate leader in the business who just won’t take no for an answer. Different from the hero or martyr in stage I, stage II has a leader with some type of organizational endorsement or mandate to make things happen. Somewhere in almost every organization is an employee trying to do the right thing. In phase II, find them and leverage what they’ve started. Shortly after I joined REI as the leader of the co-op’s first Corporate Social Responsibility program, we started getting pressure from a forest activist NGO. They wondered why the REI catalog didn’t use recycled content or FSC certified paper, which was a good question, so I started digging. I found a wonderful paper buyer who said that for years she had been buying catalog paper with10% post consumer recycled content but she never told anyone. She was using her professional judgment to buy the product with the best value; however, she worried that due to its higher cost, someone might make her stop. Over the next 6 months she was part of an organized stakeholder process that developed one of the best paper procurement programs in retail. Within 3 years REI achieved 100% FSC certified catalog paper, had the ability to track 90% of the fiber in all paper products back to the source and publicly reported the results. Best of all, we were saving money doing it, mostly from reductions in unnecessary paper volume. Instead of a secret “do the right thing” effort, the paper buyers (and the rest of REI’s employees) were proud of their work to protect forests and spoke at industry events to convince others to join in. Stage II is often characterized by a lot of emotional momentum. Progress is being made and sometimes it seems like the power of personal drive can get almost anything accomplished. Be careful. One day you’ll need powerful business arguments to propel the program (note the hard data at the link in the paper story). Start from the earliest days to gather, record and manage rigorous data. If you say you cut waste due to your employee recycle effort, know the baseline, show the math and translate that into dollars. In the early stages you might not be asked, leaders will just be happy with progress, which is why you need to hold the bar for rigor. You’ll need the data in the next phase when the metrics will be your friend. Which is an excellent transition to Phase III and the next post – stay tuned. OK – I hear you. The change chart is pretty busy, but there’s a lot packed into this infographic. In the first post in the series I highlight the key curves: The blue value & profitability curve shows that companies will be more successful as they adopt sustainable business thinking. The brown line says environmental and social consequences get worse before they get better and the green line is the “ta-da”. It represents the idea that beyond doing less bad, business can create net environmental and social value and will be more successful when they do. In this and subsequent posts I plan to dive into some detail on each phase of progress and offer some stories or examples of what the process looks like in real life. So what’s the rest of the chart saying? Each horizontal span represents aspects that evolve as the company moves along the process. For example the bold blue arrow shows the types of change: In stage I progress is pretty random. Before I joined REI there were employees who would personally sort the trash and take cans or paper home to recycle because most stores didn’t have commercial recycling options. With the introduction of a formal CSR program (stage 2) these efforts became endorsed and we went from random to making incremental improvements by getting more stores involved. Then metrics and process took over (stage 3). We set a goal of getting recycling at every location and driving toward zero waste to landfill. We started making breakthrough improvements by renegotiating waste contracts because facilities, retail operations and real estate divisions where able to collaborate based on common metrics and goals. Then we started to see the potential for systemic change by redesigning product packaging so there was less waste in the first place and it was designed to be recycled at our stores. Finally REI lead efforts at the Sustainable Packaging Coalition to help all of our vendors to do the same. A great example was PrAna’s program to eliminate poly bags from apparel. The results followed the blue, brown and green lines: Even as the business grew, waste to landfill actually started to get smaller and the process was on the way to delivering millions of dollars in cost savings through reductions in waste, labor, packaging, etc. A principal of change management is to meet people where they are – and most of us are at stage 1. In most of my writing I refer to the current status of business as “conventional thinking”. The cornerstone of conventional thinking is trade-off thinking, in other words we believe that we face a grand trade-off between environment and social responsibility and business success. One either makes money or does the right thing. Sustainable business thinking is a new paradigm. We reject the idea that these trade-offs are inevitable and seek to redesign the way we do things to craft a positive reinforcing loop – the more good we do, the more financial success we achieve and vis versa. In stage 1 we’re still thinking in trade-offs. The results on the chart prove it. Random acts are not connected. Green efforts cost more and worse yet, negative consequences are increasing faster than company growth. A good starting place for a an organized CSR program is to start rejecting the trade-off mentality. More here. In the next post, we’ll talk about getting moving in stage II.